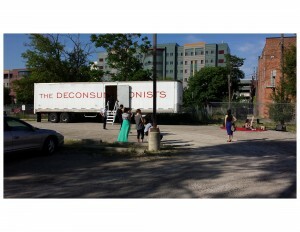 The Deconsumptionists, Art As Archive originated in Philadelphia, Pennsylvania (2009) and later relocated to Bushwick Brooklyn, New York (2012). 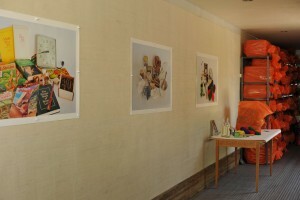 During this time, three artists’ exhibitions were presented and The Deconsumptionists also participated in “Bushwick Open Studios” events two years running: http://hyperallergic.com/72504/exploring-the-southern-edge-of-bushwick-open-studios/. This was followed by a month long solo exhibition (art engagement residency) at the Museum of Contemporary Art Detroit, MOCAD (2014). Here, three hundred museumgoers visited The Deconsumptionist’s trailer and met with EIDIA. The residency incorporated collaborative exhibitions with public programs – with an emphasis on artist run spaces. Panel discussions with invited local artists, galleries, musicians and architects also took place at this time. At the time of writing, The Deconsumptionists is at FARM gallery in Toledo, Ohio (with further exhibitions and events forthcoming). 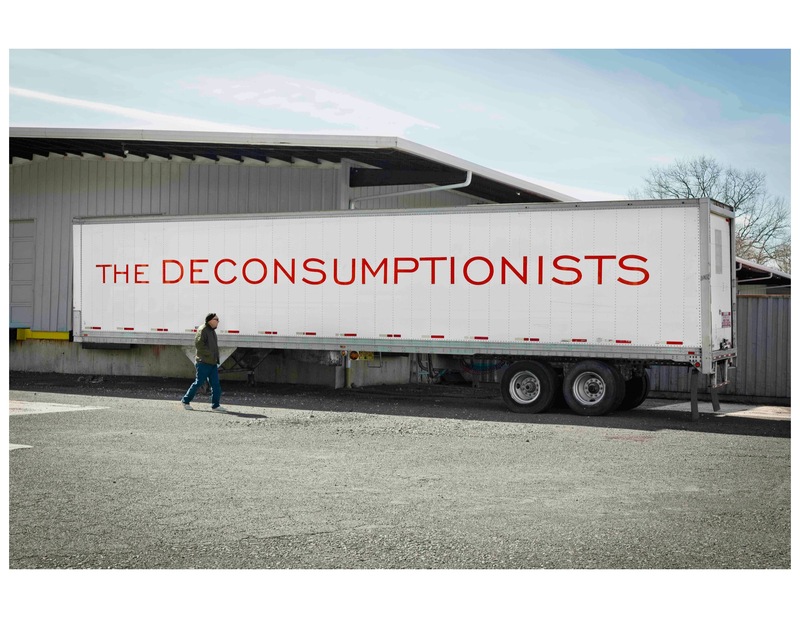 The Deconsumptionists, Art As Archive is physically realized in a semi-trailer 48′ x 13′ x 8′ as an outpost for artistic research and for propagating and promoting the discipline of “sustainable” art practice. 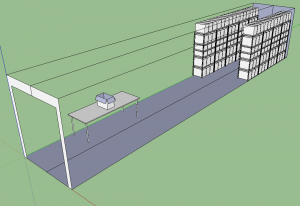 With the aid of a solar roof, the project is designed to function independently as an art exhibition / performance site for public engagement and interaction. In a future plan, the structure is to be retrofitted with living quarters for an artist residency accommodating two persons. A distinguishing feature of this (3,184 cubic feet) aluminum and steel rectangle on wheels is an archive of 171 boxes containing the collaborative accumulation of the 30-year art practice of EIDIA. 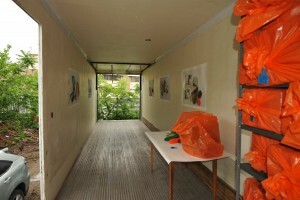 Each box is wrapped in ‘caution orange’ plastic and secured with a royal blue number tag. All contents of each box have been photographed to document the archive’s holdings, evidenced in the resulting ‘nature morte’ images, each titled by the number on its box. Being a long standing collaborative, we initiated this project as an archive for our collective works for consideration of their preservation, distribution or dissolution. Our intention was to reactivate artworks long since completed—an exercise in recycling and reconsidering the signifier (previously created art) as “new” work (essentially appropriating the self). This proto-creation through new knowledge and value recontextualizes the existing object—thus transmogrifying it with new meaning. In effect, The Deconsumptionists seeks to represent a new form of aesthetic freedom – one not defined by the quantity produced and finance invested in the art practice but rather one predicated on collecting and editing preexistent things/objects. Consequently, items once produced as new designs and inventions, later discarded as trash, are then rescued and re-invigorated with value and pertinence of meaning. Once inside, the trailer visitor experiences a peculiar sensation of the space as a readymade mise-en-scène. Accordingly, they becomes cognisant of ‘new knowledge’ a new experience, a new sensation. 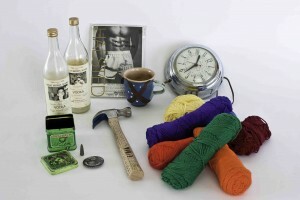 As captured in photographs of the contents each box, The Deconsumptionists place objects in an ‘archival positioning’ denoting particular sociopolitical content and meaning. In this way, The Deconsumptionists semi-trailer and its holdings metamorphose into a radicalized aesthetic context manifested as physical memory of capitalism’s unrelenting production/consumption. In doing so, The Deconsumptionists take the strategy of appropriation to a new level of discourse. 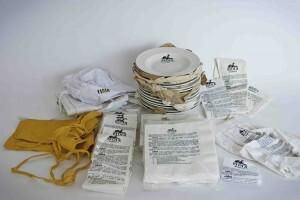 The Deconsumptionists, Art as Archive is conceived as a new version of “archive” and as an action of aesthetic resistance. 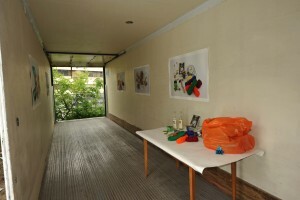 The project is essentially a massive movable readymade that posits the modalities of reassembling, repositioning and reshaping preexistent forms (found objects and ephemera) with a view to provoking a disparate conversation about consumption and production (and an ‘everlastingness’ as art). The Deconsumptionists, Art As Archive extends the responsibility of ‘cultural producers’ by examining the struggles and contradictions inherent in the production of art within the capitalist economic model. What is the global impact of what we produce economically, ecologically, and socially? Are artists a part of the problem or of the solution? Should we consider that the end product of a life‘s work could end up stored in some foundation’s collection or as landfill? In facing this literal possibility, we seek to alchemize materials of the past designed for a variable means and purposes (a used semi-trailer, random objects of decorative, functional, fashion content, and objects made to entertain), and in doing so, hope to offer new significances and meanings to these objects in a world of crisis and catastrophe. The Deconsumptionists seek to travel nationally and internationally. On location, local artists, architects, designers, performers and activists are invited to collaborate to create a variety of exhibitions, public programs and events. Please visit http://www.eidia.com/ for more information about this project, EIDIA and our numerous other projects. [i] Paz, O. (1986). Marcel Duchamp: Appearance Stripped Bare. (Donald Gardener trans.) New York: Arcade Publishing, 1990, p.89. [ii] Derrida, J. (1995). Archive Fever: A Freudian impression. (Eric Prenowitz trans.) Chicago: University of Chicago Press, 1996, P.90. [iii] Hudek, A. 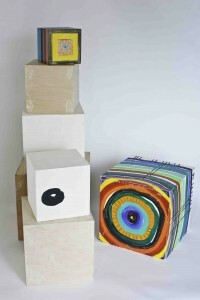 The Break-Up of New British Sculpture, Essays on Sculpture No.45. Leeds: Henry Moore Institute, 2005, p.12. www.nexus-instituut.nl The Nexus Institute the Nexus Conference, How to Change the World. Dec. 18, 2012. [v] Bourriaud N., The Radicant, (James Gussen and Lili Porten Trans.) New York: Sternberg Press, 2009, p.146.